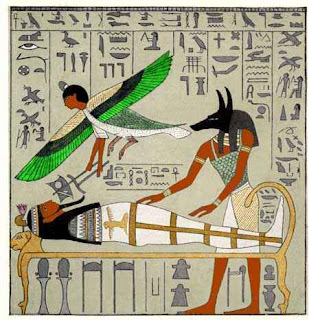 To the Ancient Egyptians death was not the cessation of life but was only a temporary transition or interruption before they enjoyed an eternal existence in the afterlife. This wonderful and mysterious place was every Egyptian's dream and so the rituals to attaining immortality were the only ticket to being reborn. Piety to the gods, preservation of the physical form through mummification, provision of statuary and other funerary equipment was as much an integral part of the religion as it ensured a safe journey to the afterlife. So the corpse had to be properly embalmed and entombed in a mastaba before it could live again in the Fields of Yalu and accompany the Sun on its daily ride. The Egyptians believed that the human consisted of living entities, the "ka", the "ba", the "akh", the "name" and the "shadow". These elements were necessary to make up a complete personality and had to be sustained and protected from harm to insure that the deceased was successfully integrated into the cosmos and enjoyed immorality in the next life. To reach a rewarding destination to the afterlife, the deceased had to pass all the tests. But first the process of preserving the body had to be successful, which took 70 days to be completed. Mummification involved removing the internal organs, removing the brain through the nose, and desiccating the body in a mixture of salts called natron. The body was then wrapped in linen with protective amulets inserted between layers and placed in a decorated anthropoid coffin. The last of the rituals to be performed by the priests on the mummy was called the "Opening of the Mouth." This ceremony was supposed to magically give the deceased the ability to speak and eat again, and to have full use of his body. After placing the mummy in the sarcophagus, the tomb was sealed. 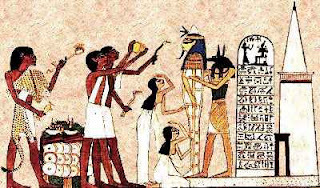 The deceased then had to wait for the sun god Ra, to come to his tomb. Ra would shine sunlight on the darkness and speak magic words from the Book of the Dead. The Book of the Dead contained a collection of spells, charms, passwords, numbers and magical formulas that aided the deceased safely through the journey of the afterlife. After Ra speaks these words, the mummies throw off their wrappings and Ra takes them to the Afterlife on his barge. For the deceased to get to the Field of Reeds which was the happy place where the dead enjoy the rewards of the afterlife. The deceased disembarks in Duat (the underworld) and has to get past seven gates before reaching the final destination. The soul of the deceased is lead by the jackel-headed Anubis, god of mummification, into the Hall of Truth, and is brought forward to be judged by Osiris. The Egyptians believed that the heart not the brain was the place for emotion and thought; it was the record of its owner's will and intentions. 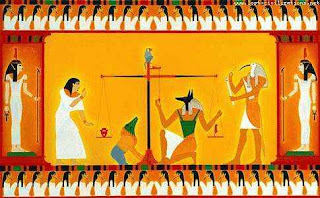 Basically, the heart was the key to the afterlife as during the Weighing of the Heart ceremony, Osiris placed the heart in a scale to be weighed against a feather which represented Ma'at (truth and order). If the heart did not tip the scale it was deemed worthy and continued on to the Osirian Fields, but if the heart was heavy with sins it was devoured by the demon Ammit (Eater of Hearts) a half dog, half crocodile god, dooming its victim to eternity in Duat. Thoth, the Egyptian god of scribes, wrote down the results. So earning immortality required a sin-free heart and the ability to recite the spells, passwords, and formulae of the Book of the Dead. The loop-hole around this was being buried with a "surrogate" heart to replace the owner's for the Weighing of the Heart ceremony. The Egyptians centered their lives on their religion and rituals to finally be rewarded with immortality, but the fear of a "second death" was to be the worst fate imaginable! Not only was it a sorrowful destiny but was considered total oblivion. So to guarantee eternal happiness having a good, honest heart was the most essential element to a safe journey into the Afterlife.